Slowly and surely Nintendo is putting to rest any brief fears that early 2018 will be bereft of notable retail games. Bayonetta 2 and its predecessor are coming on 16th February, and now we know that Dragon Quest Builders will arrive in Europe and North America a week earlier on 9th February. The news was confirmed by both Nintendo of Europe and Nintendo of America. Dragon Quest Builders builds a new home on Nintendo Switch on February 9th. As a reminder the Switch version will also have the exclusive "Great Sabrecub" which "will boost your speed and grant you special material by defeating enemies." It's great news that it's arriving so soon, and Switch owners also have the sequel to look forward to further down the road. Will you be tempted to pick this up? Going to add this to my wishlist. But I hope Square Enix does a better job of porting. Yes! I'll be on vacations. Great news! I’ve been looking forward to this! Cool. Missed out on this when it first came out, but I might give it a go this time. Oh cool. I'm not one for building games, but my sister might like this. @Shiryu I would buy and play the crap out of Dragon Quest Heroes 1 and 2. I'd rather have Heroes (in English) on Switch as well, but I might check this out. Japan gets a demo, anything whether we'll get one over here as well? So, DQ builders, or Portal Knights? I'm more focused on the adventure than the building, my son likes both. I figure I can play both co-op on Switch? Amazing game. I was completely enthralled by it on PS4, so one can only imagine how dangerously addictive it must be to have on the go. Yes! Yes! Yes! I can't wait to finally play this! Not a fan of Akira Toriyama Art style. That's why i choose Portal Knights instead of Dragon Quest Builder. Already have Portal Knights, is there enough difference between the two to warrant buying DQ Builders? And I see a couple people bringing up Portal Knights. I dunno, I tried it once and it kind of felt slow and clunky compared to DQB...not to say that I hated it, though. "So, DQ builders, or Portal Knights? I'm more focused on the adventure than the building, my son likes both. I figure I can play both co-op on Switch?" Depend on your taste of Art style. Dragon Quest use Akira Toriyama art style, same style as Dragon Ball series. While Portal Knights made by Germany developers. The Art style somewhat like My Sims Wii. Portal Knights has Very Vivid environment such as Luscious grass field, Cactus, Pine Tree, Autumn Tree, Palm tree, Crystal Tree, etc. Dragon Quest has more complex storyline and quests, while Portal Knights is more flexible, easier, simple storyline. I'm sure your son will be like Both Dragon Quest Builder and Portal Knights. No. The sequel (long since released on other platforms) is coming so going to wait for that. welp never cracked the cellophane on my ps4 copy so this will be a welcom additon to my library. Time to double dip, never finished the PS4 version, this and Bayonetta in the same month, looking like February might be more expensive than I was hoping for! man, thats a long port time. It released last year! I have DQB on Vita and I enjoyed it a lot. It works very well as an on-the-go game with lots of little quests that you can squeeze into a short space of time. I'm tempted to wait for DQB2 on Switch though, rather than double dipping. Great game but I think it's a bit overpriced normally. I got it on PS4 when it was on sale for 50% off, and for $30 US it felt like a fair price. For $60 it just doesn't seem like it would be good deal. It's a fun game that I can sink many hours into just doing a minecraft sorta thing, but the actual questing in the game doesn't have much to it. It gets boring just doing what the game wants you to do, the combat is very simplistic, and it could really use some caves to explore and so on. Still, the game is all about being a sandbox IMO. @Shiryu I was wondering the same thing. That game is MIA. I really want to try this game but knowing DQB2 is on the way with more features and multiplayer makes me put this in the pass pile. I’ve got enough games to last me between now and when the sequel gets released. Thinking of getting this game, will wait to see what the price is. hopefully it will run better than the vita version. but considering that the switch version of DQH is relatively close to the vita versions i don't have much hope. @Mando44646 I doubt that the port time has been that long. 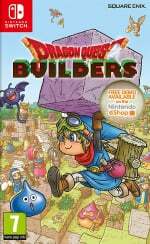 The 2 Dragon Quest Builders games were announced to be ported to Switch in August. That was just a rushed port in order to hit Switch launch. Everything since has been high quality, and this is already confirmed to not be based off the Vita version. @JaxonH what other games? i don't remember any other 3D square enix games on switch. I Am Setsuna, Octopath Traveller demo, Lost Sphear, Dragon Quest X, to name a few. Don't think "3D" has anything to do with anything. Either games are quick, shoddy ports/games or they're not. This one is a day one buy for me. Love pretty much everything about this game. This and the Bayonetta games coming out in the same short time span is gonna make it difficult. Because I totally want both and February tends to be a busy month at work for me, with little time off. @Supadav03 That is my plan. After getting the PS4 version on sale I can safely say that it isn't worth getting on the Switch. The game could use a lot of improvement and I am sure the sequel will address most of the issues. Until then Portal Knights will hold me over on this type of game as far as the Switch goes. Yeah this game definitely shouldn't be the full priced tag when there is already a sale of the game and it's been 1 year almost 2. It's something I'll add to my wish list and wait for a massive price drop if it is indeed a full priced game. Meh I rather just wait for part 2, my hype for the first one is already over. If I get a Switch I'll definitely pick this up. I loved it on the PS4. This game was released on PS3 in Japan, but only on PS4 in NA/Europe. I really wanted to play it on PS3 when it came out and I was so bummed it was only available in Japanese. I was hoping it would be ported to Switch and now it finally is close. I'm just hoping they won't charge full price because I am willing to pay 39 € at best. Else I will pass and just wait for DQB2. Have it on PS4, it isn't that fun, to be honest. I think it relies too much on nostalgia. Probably going to pick it up after I finished Battle Kingdom and Xenoblade, since there won't be a lot of games around that time for Switch. Is there a physical version of this though, or is it e-shop only (Europe)?